The best part about indoor water parks? You can visit them any time of the year! 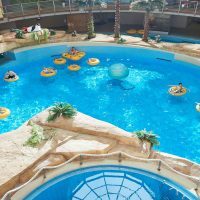 Pack up your swim suits and head to one of these amazing indoor water park resorts, all of which are Family Vacation Critic Favorite Hotels. Great Wolf Lodge has 18 locations, all of which offer indoor water parks with multi-story forts, 1,000-gallon soaker buckets, wave pools, lazy rivers, waterslides of varying heights and speeds, raft rides, whirlpools, kiddie pools and more. But our favorite one for 2019 is the Great Wolf Lodge Poconos, which is undergoing renovations that include new attractions and updated guestrooms! Kings Pointe Waterpark Resort, a lakefront destination resort in Iowa, offers both an indoor and outdoor water park. The indoor water park is especially ideal for youngsters, with a zero-depth entry pool and floating lily pads. Big kids will get a kick out of the Electric Eel, a slide on which riders design their own virtual experience! Riders will see and hear storms they created, as well as bears, sea creatures and sharks, on the way down. 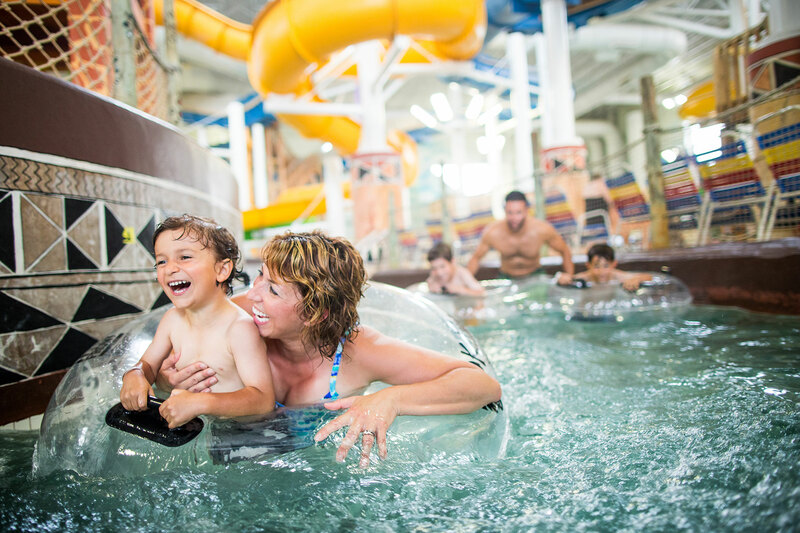 Kalahari Resorts offer gargantuan water park environments; in fact, Kalahari Resorts & Conventions – Wisconsin Dells is actually America’s largest indoor water park! Attractions include waterslides, water coasters, tube rides, surf simulators, a wave pool, lazy river and whirlpools. Rent a cabana to enjoy comfortable chaise lounges, a TV, refrigerator and privacy, and at the end of the day, retreat to your spacious guestroom or suite; some suites offer up to 10 bedrooms! Kalahari Resorts can also be found in Sandusky, Ohio; Pocono Manor, Pennsylvania, and soon, Round Rock, Texas. You can’t beat Bridges Bay Resort‘s location on Lake Okoboji! 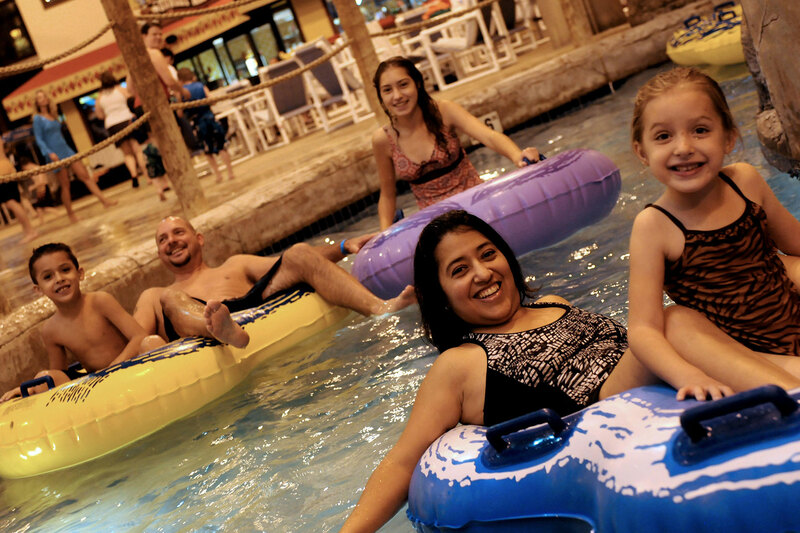 When you’re not out on the lake or on the rides at Arnolds Park Amusement Park, go for a swim, climb aboard a pirate ship, float along the lazy river or wait for the giant dump bucket to fill up and cool you off at this indoor water park resort. Bonus: Bridges Bay Resort offers apartment-style accommodations that are perfect for families. There’s not just one indoor water park, or two, or even three at Wilderness Resort — there are four! Choose the 70,000-square-foot Wild Water Dome at the resort’s New Frontier Region for an enormous pool beneath a dome of windows. Kids will love the Wild West Waterpark at the Wild West Region for bumper boats, and the Klondike Kavern at the New Frontier Region for climbing and activity play in the water. Tiny tots will enjoy Cubby Cove’s shallow and quieter waters. The resort offers four different lodging accommodations, from a traditional hotel to private cabins, all able to accommodate large families. There are also five onsite dining options. The only indoor water park in central New York, Cascades Indoor Waterpark can be found at Hope Lake Lodge in the Finger Lakes. A wave pool, 500 feet of slides, toddler activity pool, indoor/outdoor heated pool and an activity tower with a 500-gallon bucket dumper are on offer and kept at 84 degrees Fahrenheit, even in the dead of winter. The lodge is also an all-suite hotel, meaning families will enjoy spacious accommodations with kitchens. Bonus: Hope Lake Lodge is located across from Greek Peak—go for a few runs down the slopes before hitting the water park! Located at Camelback Lodge in the Poconos, Aquatopia is the indoor water park to visit with kids—whether it’s when you need a break from the ski slopes or you’re just looking for a mini-vacation in the spring! 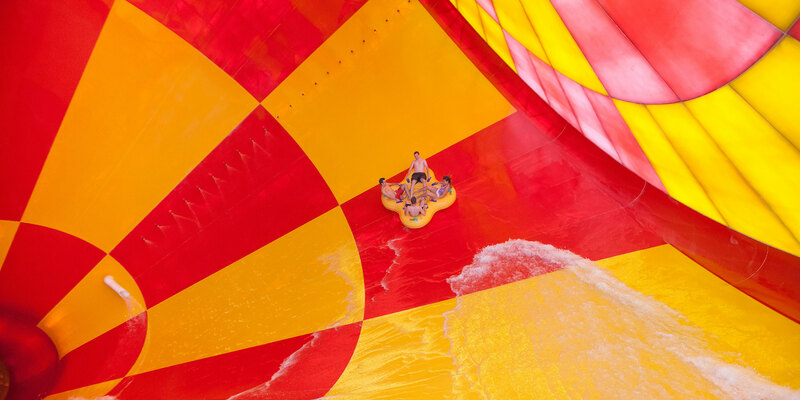 The mega water park features 13 waterslides, seven pools and the longest indoor water coaster in the U.S.! Little ones can head to Penguin Play Bay for thrills designed just for them. When you’ve had your day’s fill of Aquatopia, visit Arcadia for classic games and prizes; try rock climbing; play a round of mini-golf; let the kids’ get a spa treatment and more! Visit this Smoky Mountain retreat to explore the largest indoor/outdoor water park resort in the southeastern U.S. Wilderness at the Smokies features three water parks in total, including the year-round Wild WaterDome indoor park. The five-acre indoor park includes a wave pool, surf rider, and two thrill rides. Families will also love Treehouse Springs, a themed, outdoor area for little ones, and for parents, climate-controlled cabanas and a bar! The water park is shared by two lodges: Stone Hill Lodge, with hotel rooms, and River Lodge, with condos. Lake Geneva, Wisconsin, warrants a family vacation on its own—and Timber Ridge Lodge & Waterpark simply seals the deal. 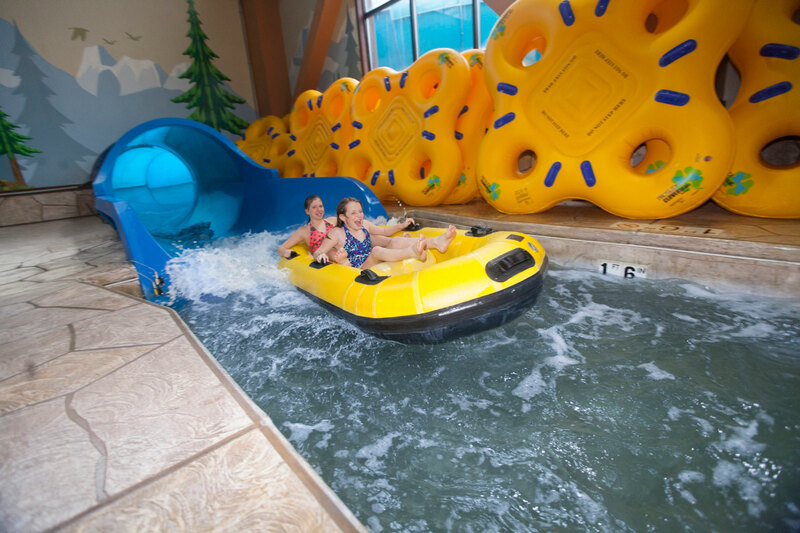 This indoor water park resort features something for all ages: Tiny Timbers is a play area just for little ones; the activity pool is great for kids between age 7 and 10; Timber Rapids and Avalanche Falls offer thrills for tweens and teens; and the Canyon River lazy river and hot tubs offer fun for the whole family. When everyone’s fingers start to shrivel up, towel off and head to the arcade or spa, or, if visiting in the summer, go horseback riding or play a round of mini-golf. Jay Peak Resort‘s Indoor Pump House is epic. 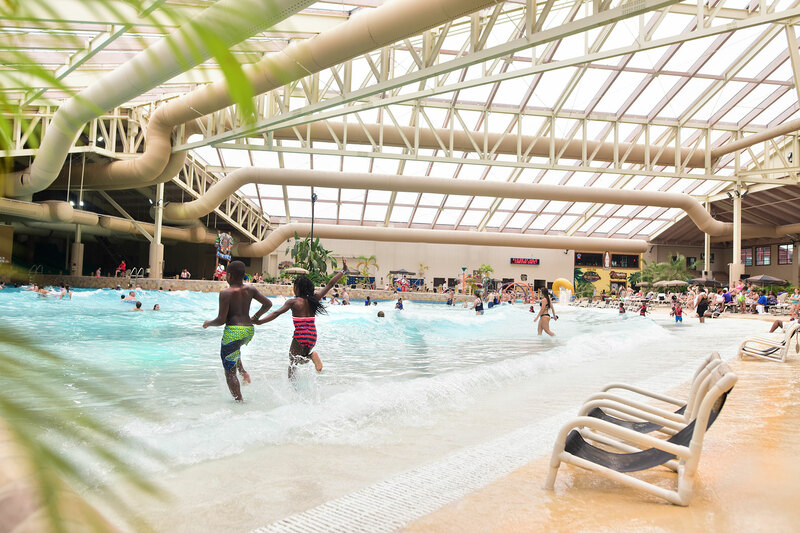 The indoor water park features the La Chute (French for “The Drop”) waterslide; a FlowRider surfing simulator; a kids’ play area; and the ever-important lazy river. Fun Fact: The indoor water park resort’s hot tubs were recently named among the 10 Resort Hot Tubs Worth Traveling For.